Looking for a commercial breading table to help you bread and better chicken, fish and all your product? 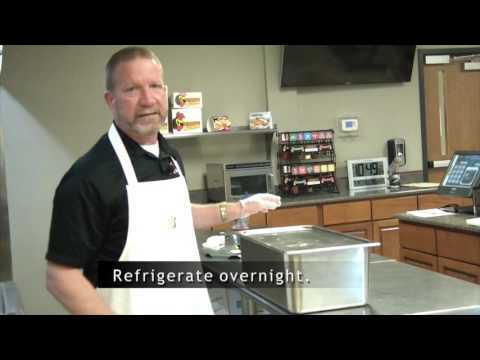 Find out how the PFSbrands breading table can save you space, time and money! 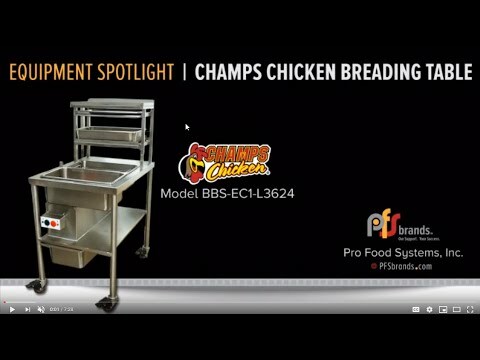 Designed by one of the most successful BWB fried chicken franchises in the United States – Champs Chicken – if you are a professional then you need what the pros use! Entirely closed blender/sifter assembly constructed from durable stainless steel, employing a rotary sifter mechanism that operates without vibration or agitation. Spirally-configured nylon bristles form a rotary auger that ejects unwanted dough balls to a separate waste container. This unique process prevents the grinding of dough balls through the sifter screen, reduces usual sifting noise, and mixes the breading ingredients as it sifts. Whether you are using custom fish breading or chicken breading you get quality, consistent breading! PFSbrands BBS-EC1-L3625 Auto-Sift Breading Table ‐ Automatic sifter unit and casters. Includes 8″ deep s/s full size pan w/hole & plug, 8″ s/s full size pan and batter basket. With over 35+ years of combined experience in foodservice, the experts at PFSbrands have put together the perfect breading table to make your prep a cinch!